Benefit They're Real! Beyond Mascara is the mascara that's beyond belief! 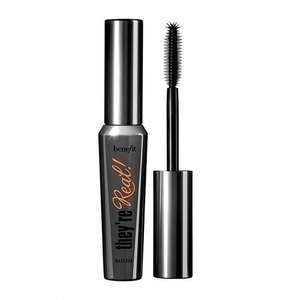 It lengthens, curls, volumises, lifts & separates lashes for a spectacular "out-to-here" look. The exclusive brush is specially designed to maximise the performance of the long-wearing, glossy formula-revealing lashes you never knew you had! Staggered bristles grab close to the root, boosting length & volume beyond belief. The precision bristles on the custom-domed tip lift, define & curl even your tiniest lashes. The end result... luxurious, silky lashes that won't smudge, clump or dry out. can the code be used for other products? They may say it is smudge proof, but I can assure you that I ended up with huge black smudges under my eyes which was impossible to rub off. Had to go home and use eye make up remover. It was a cold day and my eyes watered. Don't use if your eyes water either from the cold or if you cry easily. Took mine back and got refund. If it was waterproof it would have been wonderful. Great deal! Ordered! Thanks OP! yeah I used the code for this mascara and the porefessional cover up stuff and for both for £35.55 with a free make up bag, delivery and a couple of samples. plus the quick on top of that too. I would like to know if this mascara is highly recommended as I always buy mascara's and find they are no good - I have so many ?? Thank you OP great offer ! It's well worth a try at this price. I really like this mascara as my first coat. Separates and lengthens brilliantly then I go in with my Diego dalla palma. The roller lash is absolutely my holy grail though. yeah I used the code for this mascara and the porefessional cover up … yeah I used the code for this mascara and the porefessional cover up stuff and for both for £35.55 with a free make up bag, delivery and a couple of samples. plus the quick on top of that too.stocking fillers sorted! Doesnt work,at checkout only takes off £1.95??? TDon't use if your eyes water either from the cold or if you cry easily. Back in stock and now £12.75 with the BLACKFRIDAY15 code.